How the cochlear implant works? 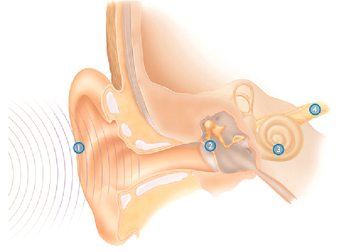 Sound waves move through the ear canal and strikes the eardrum. These sound waves cause the eardrum, and the three bones within the middle ear to vibrate. The vibrations ripple through the fluid in the spiral inner ear known as the cochlea and cause the tiny hair cells in the cochlea to move. The hair cells absorb the movement and change it in to electric impulses, which are sent to the hearing nerve and then to the brain, where they are interpreted as sound. What is cochlear implant ? 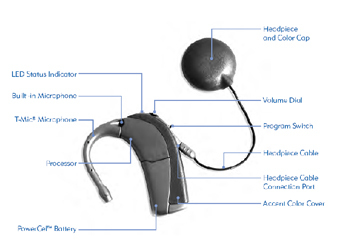 Cochlear implant (bionic ear) is a device that restores useful hearing in severe to profoundly hearing – impaired people when the organ of hearing situated in the inner ear has not developed or is destroyed by disease or injury. It bypasses the damaged hair cells in the inner ear and directly stimulates the spiral ganglion nerve fiberes. These spiral ganglion nerve fibers of auditory nerve provide information to the hearing centeres in the brain through direct stimulation of the hearing nerve. An electrode array inserted into the cochlear to provide the direct electrical stimulation to remaining nerve fiberes. A transmitting coil, a small disk about the size of a one rupee coin, which adheres to the skin behind the ear via a magnet and is connected to the microphone by a small cable. How the cochlear implant works ? 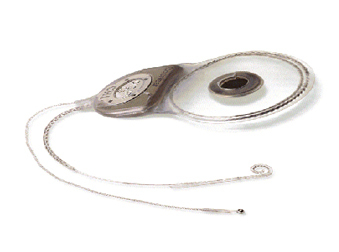 The Nucleus Freedom cochlear implant system has both external and internal parts. 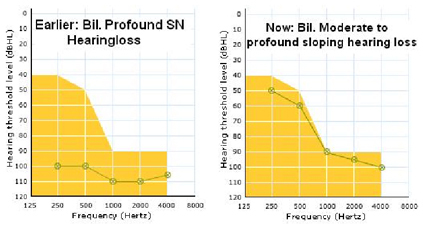 Nucleus Freedom Processor (A) with coil (B) is worn behind your ear. Nucleus Freedom implant (C) is placed just under the skin behind your ear. The Speech processor captures sound and converts it in to digital code. The speech processor transmits the digitally coded sound through the coil to the implant just under the skin. The implant converts the digitally coded sound to electrical signals and sends them along the electrode array which is positioned in the cochlea. The implant electrodes stimulate the cochlea’s hearing nerve fiberes, which relay the sound signals to the brain to produce hearing sensations. 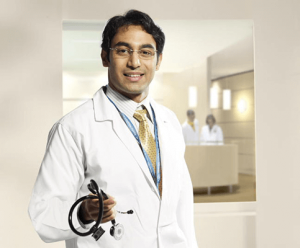 Each professional will have different roles and responsibilities in the cochlear implantation process. The ENT surgeon, Audiologist, and Auditory verbal therapist play major roles in the entire process. Pre-operative investigations, candidacy selection, selection of device, counselling patients/parents, setting appropriate outcomes & realistic expectations, pre-operative counselling, surgical procedure, interoperative monitoring is majorly done by cochlear implant surgeon and Audiologist. Rehabilitation includes fitting the external device, programming the device and teaching the spoken language, making them listen and learn is majorly done by Audiologist and Habilitationist. Having severe to profound sensorineural hearing impairment in both ears. Cochlear limited, Melbourne University and European center for cochlear implantation and other groups with collaboration of Advanced Bionics and Med-EL Corporation supported the new selection criteria of considering Bilateral moderate to profound sloping sensorineural hearing loss (with profound hearing loss at high frequencies) for cochlear implantation. 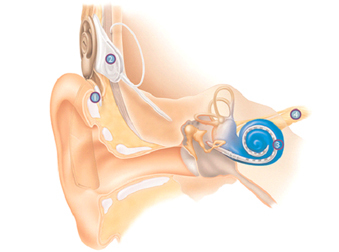 Cochlear implant surgery is performed under general anaesthesia, and typically lasts between two and four hours. Give very short haircut 3 days prior to surgery using machine/clipper. Patients are typically returned to the recovery room with orders for anti-nausea medication. 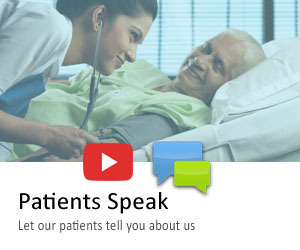 Most patients have minimal nausea and vertigo; there is usually a one-night stay in the hospital following the surgery. After bath, the operated area should be gently dabbed using a soft towel. Vigorous wiping should be avoided. Send patients home with their mastoid dressing intact and 7 days of an oral antibiotic and pain medication. Provide follow-up care in 2-3 days to remove the mastoid dressing. Many patients now simply remove their mastoid dressing at home on postoperative day 2 and are instructed to inspect the wound for bleeding or hematoma. Schedule a second visit at 2 weeks postoperative, and schedule plans for device stimulation 3-4 weeks following the initial surgery.